Mumbai: Shares snapped a three-day slide on Tuesday as investors bet the Reserve Bank of India (RBI) will indicate a shift in its inflation-focused policy stance to support growth after industrial output shrank for the first time in more than two years. “There are high expectations that the credit policy will at least signal an interest rate reduction, if not an actual reduction," said Deven Choksey, chief executive and managing director of brokerage K.R. Choksey. The 30-share BSE index, or Sensex, closed up 0.83%, or 132.16 points, at 16,002.51, after falling nearly 6% over the past three sessions. “We saw a minor recovery because of a technical pullback," said Alex Mathews, head of research at Geojit BNP Paribas Financial Services. “However, fundamental macro indicators are still giving a negative outlook for the market in the medium term. Going forward we may see further downfall," he said. Energy major Reliance Industries, which has the heaviest weight on the main index, rebounded 2% and led the gains. The stock, however, is down 29.8% this year on falling gas output from its fields off the east coast. Software services bellwether Infosys, which gets more than half its revenue from the United States, rose 0.4% as a slump in the rupee to record lows was seen as boosting the company’s earnings. The rupee fell to as low as 53.52 to the dollar, taking losses to about 18% from its year-high in July, on worries shrinking domestic factory output and Europe’s debt crisis could dampen risk appetite. Data on Monday showed October industrial output slumped 5.1%, the first drop in more than two years, building pressure on the RBI to ease monetary or liquidity conditions. On Friday, India slashed its full-year growth forecast amid slowing domestic and global demand and officials warned the government was facing a serious balance of trade problem. Engineering conglomerate Larsen and Toubro, which could be hit by a slump in capital goods investment, fell 2.1%. 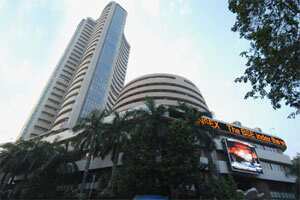 In the broader market, losers led gainers 868 to 551 on total volume of 561.2 million shares. The 50-share NSE index ended up 0.76% at 4,800.60, while the MSCI’s broadest index of Asia Pacific shares outside Japan was down 1.11% by 04:24 pm.